Hockey Pants are a vital part of your gear. They protect most of your upper thighs and hips and tailbone. The amount of protection put into pants is amazing while also being able to keep a lot of mobility. Today we’re going to show you what you need to know before going out and buying a pair of pants. 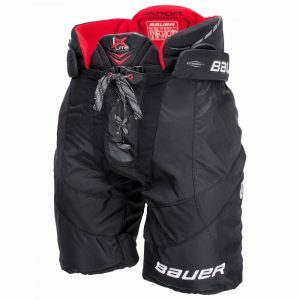 I’ll also show you our top ten hockey pants as we go into 2019 in professional grade and beginner grade. Also be sure to check out our home page and feel free to browse the site for more awesome reviews like this one like our last review Best Elbow Pads For Hockey 2019 . We hope this review helps you find the right pair of pants! How Should Hockey Pants Fit? What Size Hockey Pants Do I Need? How Long Should Hockey Pants Be? All these are good questions and I’m going to answer them all right here. So for the first one mostly it preference, but they should hold a good grip on your waist and be flexible enough for you. The second question is answered here in the hockey pants fitting guide for to measure and go off of. And the third is all preference as well, they really shouldn’t be past your whole knee cap and the shortest i’d say is about an inch and a half above the knee cap. Now lets get straight into our best selection of Hockey Pants, guaranteed to enhance protection as well as comfort. Also you can save yourself plenty of time by pressing on the name of the pants below in the table which will take you down straight to the review instead of having to scroll all the way down! So, this product has so many new features to offer and Bauer have done a great job with this product. There was a change in the pants last year but this time around they have adopted the traditional pants construction. The pants have the griddle like features which are ideal in giving you customized fit and supreme comfort. There are anatomically formed PE inserts that are loaded with high density foams and it will protect your kidney. Bauer have focused on providing excellent protection and safety to the users. Your hips will be protected at a very high elite-level. The thick padded belt line gives you more protection and there is a cool Bauer logo on the padded belt line as well. Because of the Velcro and foams you will get very nice comfort across the stomach. Well, majority of the pant below the waist line is full of traditional denier nylon. On the lower parts of the pants, there is more protective material (nylon) because the lower part of the pants are rubbed more on the boards. So, this will protect your lower part of the pants as it bears the most wear and tear. The injected molded plastic with medium density foams will protect your hips. The Bauer has done a great job with this product and they have made it sure that the users get amazing protection, customized fit and insane comfort. The power light technology the Bauer have used in the lower part of the thighs. The technology is driven from that Odin project and the 3d scan bodysuit route for all those professional players. The pants will work really nice and will provide you amazing fit all around. Verdict: When it comes to elite-level pants, it doesn’t get much better than this! They are unbelievably light but most importantly, they don’t move around like some of the others do. You can click here for current pricing on Hockey Monkey. This top line CCM product is loaded with 400 denier exterior with HD overlays through the highway area. This will give you top level durability and comfort. You will also feel very dry and fresh during the game as the Dryfoam technology used in the pants will absorb less water. CCM has also updated the closure system and there is an internal construction this time around. Well, I believe this is a really great move as most of the Super Tacks are also using the same feature. The construction and the latest technology used in the pants work really well in providing you that top-level protection, comfort, and durability. There is a one-inch zippered extension fit system perfect for tall and lanky players. 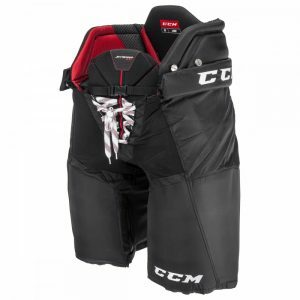 CCM have also used high-quality material and that’s why the hockey pants are super amazing. They have used the RocketFrame composite, which is a very lightweight and high strength material for the spine guard. This technology will provide an extra layer of protection to the back. If we talk about the lower thigh guards then they have the two-piece construction. So, again this will give you that super protection and mobility. As far as the liners are concerned, CCM have done something different this time around. They have used the dual zone microfiber laminated liner with dry foam technology. Verdict: Again this one is for the elite-level players here and on the premium end of the price range. However, let me say that these have an unbelievable level of protection without comprising on weight, they are as light as feather and won’t get in the way when you are out there on the ice. You can click here for current pricing on Hockey Monkey. So, without further due let’s dive into it. The construction of the new pants is really good as they have used the Pro 400D Nylon in the padded belt line and in the kidneys as well. The Nylon used in the pants is very durable and protective. Because of the good lace up and internal belt system the pants will give you a really good fit. The fitting of the pants is really important and that is something really fundamental and necessary. So, here CCM fulfils the requirement and you will not feel too bulky or too sloppy. For the management of moisture and keeping the pants dry, CCM has used the soft laminated liner. They have also used the traditional moisture wicking nylon that’s going to be very effective in removing the moisture. There are anatomically shaped kidney guards and there’s going to be a plastic insert that’s going to be loaded with thick medium density foams. So, these foams will provide you really good protection and comfort. The Greater The Force of Impact. The More The Molecules Lock Together and The Greater The Protection. So, this above line defines the purpose of this technology in the CCM Tacks 7092 Senior Hockey Pants. The LITE by D30 does an amazing job in absorbing the impact energy keeping you protected. They have also used the best foams in the pants so, these pants are really amazing and the advanced technology make it even more exciting and worth of using the pants. 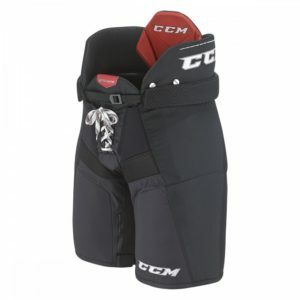 How The CCM Tacks 7092 Hockey Pants Are Super Protective? Well, if you take a close look then every part of the lower body is covered by the pants. Like there is JDP cap reinforced with D30 LITE which will provide high level of protection to your hip by dissipating the energy impact. The thigh guard will come in handy as well. There is molded PE protection which will protect your kidney by providing high level of impact protection. So, if we take a look at the back then there is D30 LITE along with HD Floating spine protector that will provide insane protection to your back. Verdict: These are incredibly light weight! For the price point (like this one on Hockey Monkey), you can’t go wrong. They fit pretty well to and overall a great pair hockey Hockey pants. Let’s start with the strapping system of the Easton PRO7 Hockey Pants. They have used a single nylon strap with a good fitting according to your choice and you can adjust it to get the ideal comfort and fitting. Apart from that, there are amazing technologies used as well for amazing protection. From the shell 400D with abrasion stripes to the stretch material with lace closure to the protection of spine, kidney, and thigh. The Easton PRO7 hockey pants are ticking every single box. Well, the strapping system and improved technologies of the pants have taken the comfort and traditional fit to the next level. The Easton staff has done a tremendous job in providing their clients an excellent product. The strapping system and the traditional lace fastening system will give you that really good fit. For the Kidney, they have used medium density foams which will again provide you comfort and protection. There are molded plastic inserts that will give you an extra layer of protection. Why Are The Easton Pro 7 Pants Super Protective? Easton PRO7’s are super protective yeah ok but why is that so? Why are these pants an ideal match for your body type? Well, you must have all these questions and the amazing technology and structure of the pants will answer all of your questions. The shell has 400D with abrasion stripes and the EASTON Pro 7 hockey pants are used by professional hockey players because they know they are going to get amazing protection. The pants will also make you remain dry and fresh during the game because the ventilation system is very good as well. There are different stretch areas in the pants which will provide you with durability, streamlined fit, and amazing protection. Two of the most important technologies used in these are PE molded kidney protector and lower back protector. So, all of your important lower body parts are covered by these pants. The one-piece thigh guard and Easton screen printed logo are there to give you protection and stylish look respectively. Verdict: These Easton pants are a must have and you are definitely going to love this product for its durability, streamlined fit and insane protection. They are very good value for money right now if you are interested (like this one on Hockey Monkey). The top of the pants are super strong and protective as there is molded plastic insert with the addition of all-new air light foam it’s a very high density and tough. The best part about is its ability of not absorbing water and making you feel fresh and dry all the time. Down through the center, these pants are thirty percent lighter than the traditional high-density foam. They have done a great job of providing the lower abdomen great protection. They have used really high-density foams for the lower abdomen part. Well, the Bauer Vapor APX2 Senior Hockey Pants are super comfortable and fit. They have used the traditional strapping system and also a dual adjustment buckle. There are some suspender buttons used as well. Above all, they have also used the belt line that runs all the way from the back and it also has some nice and cool logo stitched on it as well. If we talk about the adjustability of the pants then the Bauer has used an adjustable extension fit (+1 in length) and the Kidney molded segmented construction is very helpful as well. The pants are made with stretchable fabrics so you can make long strides keeping your motion nice and smooth. The great aerolite spinal guard and the kidney guard wraps all the way around the back and it gives you that good protection and coverage. They have used the Liner 37.5 technology along with the use of 840 denier nylon. This will provide you with great protection and really good durability. They have done everything right in providing you insane protection. Another example of that is the use of the molded plastic insert. These molded plastic wraps around the leg back with medium density foams to give you pro protection. What Does 37.5 Technology Do? So, why this technology is very effective? Well, they have used this technology to make the pants stay drier and fresh all the time. This technology wicks away moisture and makes you feel fresh and cool. So, how does this work? Well, the technology uses your own body heat to evaporate the water and the harder you work the harder it makes the water evaporate. So, the high-grade technology used in the Bauer Vapor APX2 Pants will give you that high-level protection and comfort. Verdict: These pants feel soooo snug and pretty easy to skate in because they don’t have that bulky feel that you might get from extra padding. You also get great movement in all motions so definitely worth spending that extra little bit of dollar on these. If you want to find out how much they are then check them out here on Hockey Monkey. The Bauer Vapor 1X Lite pants are loaded with some advanced technology. The Bauer team has added some really cool features in these pants. You are going to love the product for so many reasons like the Curv® composite spine protection and the Hyperlite HD foam in the kidney and thigh areas. From the tapered vapor fit and design to the 37.5 technology sanitized odor resistant the Bauer Vapor 1X Lite pants are really amazing. Well, now let’s talk about the basic features that it offers like the breathability, comfort and the fit of the pants. The pants offer tapered vapor fit and the construction of the pants is well organized and that is why you will feel very lightweight and comfortable. There is an inner lock belt system as well. You can get the customizable fit and they have also added an extra feature that will allow you to get that extension which can give you your desired length of the pants. The liner used in the pants is of high level and it uses the body heat for the sake of evaporation. So, you will feel very relaxed and dry during the game as the liner will absorb all the sweat. The moisture absorbing speed of these pants is five times better now. They medium density foams are also used in the zipper to increase the comfort level of the pants. Why These Pants Are Super Protective? Now coming to the protection, the Bauer team has used the Aerolite technology in it. The aerolite foam is starting in the kidneys. For those who don’t know about the aerolite foam the foam is super protective and it is a high-density foam which reduces the overall weight by 30% while maintaining the pro-level protection. As these foams are thirty percent lighter than all the other foams so this is why they are super protective and lightweight as well. Aerolite™ is an ultra-lightweight HD foam with extremely protective properties. 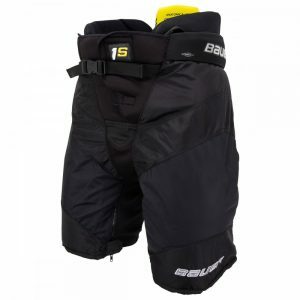 The Bauer team has also used the Aerolite 2.0 in the hip area of the pants as well. There is also Curv composite which is a high-level carbon composite shell which is really lightweight but evens stronger than plastic. So, you are going to get that amazing feel and insane protection all at the same time. The Denier Nylon is also used in the pants which will provide you great durability and breathability during the game. Verdict: So, the Bauer Vapor 1X Lite Hockey pants are offering you top quality and insane protection. You are getting everything in it from durability to comfort to class to protection to the advanced technology. They are on the more premium end (like this one on Hockey Monkey) but you get what you pay for and with these you get a lot! 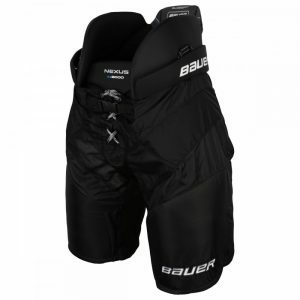 The Bauer Nexus 1000 Senior Hockey Pants have something really exciting to offer that no other pants offer like their super advanced technology and the MOLDED EPP BODY PROTECTION. The Bauer team has constructed these pants so beautifully that they have added so many cool features in the pants. Just get one thing in your mind that the pants are from the new Nexus line so all the top-level features will be available in these pants for sure. The Bauer team has used the EPP foam construction in the pants for the top-level protection. This foam is basically for the upper part of the body like for the spine and the kidney parts. This molded EPP foam improves the impact characteristics as it is 10% lighter and 15% more protective and it is way better as compared to the traditional double density foam construction. It is very soft from the inside and there is the plus liner which is the best liner that Bauer has ever produced. The moisture wicking capabilities are really good and it has a really nice soft touch. You will also love the embroidered Bauer logo along with the nice padded belt line. 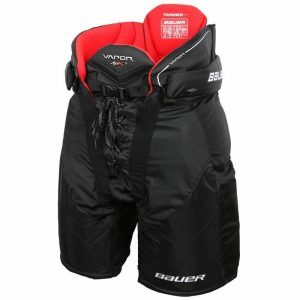 I personally think that the Bauer Nexus 1000 Senior Hockey Pants are super comfortable and protective. The traditional lace enclosure system adds an extra layer of comfort as you can take long strides and still can feel at ease and mobility. In short, that classic fit is there that provides you wide range of stride. The Bauer team has used the most heavy-duty nylon in the pants. So, the 800 Denier Nylon will offer you great durability and comfort. There is two-piece hip protection and there will be molded high density foams with a plastic insert in it. F-One Shell Technology – this is a premium energy absorbing technology used by Bauer. This technology is located in the hip guards and thigh guards. So, you will remain safe from all the high impacts shots. This also keeps the product lightweight while giving you really good protection. Well, these pants are simply amazing for their high quality, top-level material, construction and all those cool features. You are going to get every possible feature that you have in your mind. They have used nice stretchable material in the inside and used advanced technology for top level protection and comfort. The highlight of the pants is the EPP foams that they have used in the pants which provide insane protection to different parts of the lower body like from hip to spinal to kidney. Verdict: These are very good pants, especially for high level amateur players. We have also heard that these are a great choice for lanky players as they sit really well and offer great mobility. Such awesome price as well so go and check them out here on Hockey Monkey. 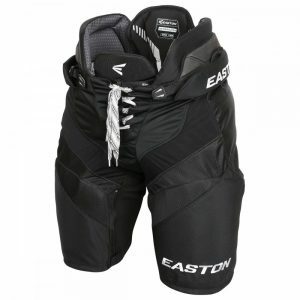 These hockey pants have a really good strapping system in which you will see two nylon straps on either side and additionally there is that traditional lace fastening system as well. So, this unique lace system gives you an incredible fit that stays in place all the time. You are going to get nicer fit and amazing protection for a very reasonable price. 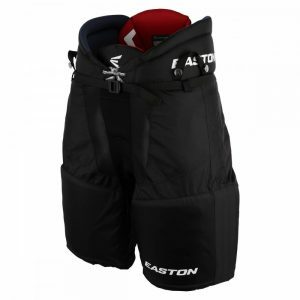 Why The Easton Stealth CX Senior Ice Hockey Pants Are Super Protective? Well, the Easton team has focused on every part of the lower body and has provided really great protection to all the parts. There is Easton’s high permeability armor which is a combination of segmented medium and high-density foams along with the Easton’s hyperlight high density foam. The Hyper Mobility Armor is loaded with the Hyper lite molded HD foam which is available in multiple layers. This will ultimately provide you great protection and a lightweight fit as well. There are medium density foams used in the lower section of the pants. All the foams in the lower part of the pants are loaded with plastic inserts which will give you great protection. They have also used the extension zipper so if you are a fan of looser fit then these pants will help you with that as well. If we talk about the exterior of the pants, then there is dura shell which is a combination of nylons and mesh which provide you abrasion resistance, durability and good air flow. So, the ventilation and the durability are really great because of the Easton’s dura shell construction. You will feel very fresh and dry during the game. Furthermore, there is a stretch gusset which allows you to have great breathability and mobility while you are playing the game. The Easton’s embroidered logo at the bottom of the pants looks really cool too. The spine guard features the Easton’s active flex design that will keep your spine in place when you are leaning forward. This guard is also very flexible because there are two elastic straps on either side to keep it flexible and a lot smooth. Great pants for great price! Well, you will get amazing features for a very reasonable price with these pants. Whether you talk about there DuraShell or the Active Flex spine, the Easton team has taken the comfort and protection to the next level. The Lining: Bio-Dri™ moisture wicking liner with anti-microbial treatment and PE tailbone inserts keeps the pants dry and fresh during the game. Verdict: We are a big fan of Easton products and these have to be one of their best! Just very comfortable and snug. We love pants that are light and fit close to the body. Plus the prices on these are just incredible (like this one on Hockey Monkey). Conclusion – These lightweight hockey pants are the latest in CCM’s Quicklite line offering a snug fit and excellent mobility that let’s you react on a dime. 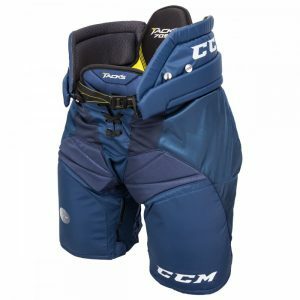 CCM also nailed the protection part of these pants with light weight high quality foams inserted into the pants. The hip and kidney section offers pro protection. These pants overall have a nice wrap around the thighs creating a compression like feel while giving tremendous protection. This pair of pants goes to the top of our list of pants ad we’ve even made an in depth review on them, you can find that right here: CCM Quicklite Sr. Hockey Pants Review. 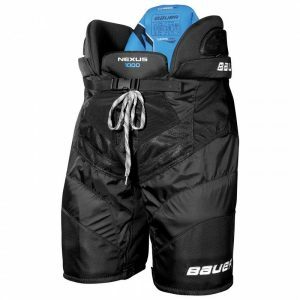 The Bauer Nexus N8000 Senior Ice Hockey Pants was designed in the best way possible. There is a two-piece ergonomic PE plastic guard used in the thigh guard. This guard will help you block all those shots and giving you that ultimate level protection. The nylon belt along with the traditional lace system will help you get the desired fit. The Bauer has also used the kidney guard which is a very high-density foam design which uses really high-quality foams to make you feel fit and protective yet lightweight. In order to make your hip feel comfortable the Bauer team has used really comfortable foams. We can say that the Bauer has kept it simple by using an impressive molded dome construction PE cap that will offer a high level of protection. The pant also uses the 400 Denier Nylon which is used to provide you great durability and make you feel lightweight as well. The Bauer has also used high density foams in the Spine Guard along with the plastic inserts. This will give you a nice mobility and flexibility. This will provide you great protection for your lower spine. The fabric used in the pants are very stretchable so you can take long strides while making a shot. The Bauer has also used the Thermo Max Liner to increase the comfort level of the pants. These pants are an ideal one for all those Big Boys out there. The construction of the pants is literally amazing and with all the advanced technology and design these pants are will surely impress you. The Bauer team has used high quality foams in different part of the pants to provide you that top level protection and comfort. They have paid enough attention to every little thing. Verdict: These are worthy of making our list and one that’s just fantastic value for money (like here on Hockey Monkey). We couldn’t believe how light these feel, they don’t have that bulky feel you get with some of the others.